I’m a hound for handmade, healthy, skin care on Amazon.com. Want to get me singing?! Lets talk about sampler kits! Kind of like a car, I appreciate a good, test-drive! My skin is the same, before I drop the dollars! 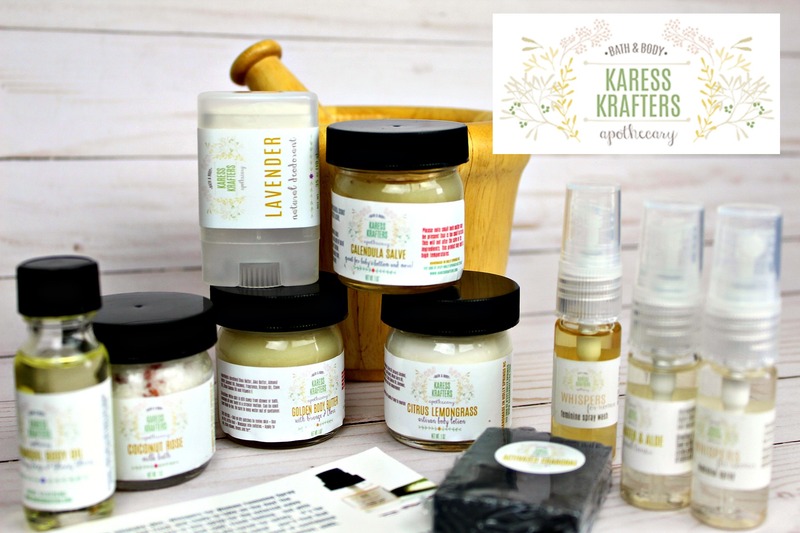 Recently, while hunting Amazon, I found KaressKrafters.com – leading me to write this Karess Krafters Apothecary Review! Based in Holly Springs, North Carolina. Karess Krafters hand-make aromatherapy skincare products in small batches, will love! All-natural, void of any toxic ingredients, see it all in my latest vlog below! SEE MY VIDEO REVIEW HERE! PLS drop me a “LIKE“, “COMMENT“, or even better – “SUBSCRIBE“! Your skin will thank you! 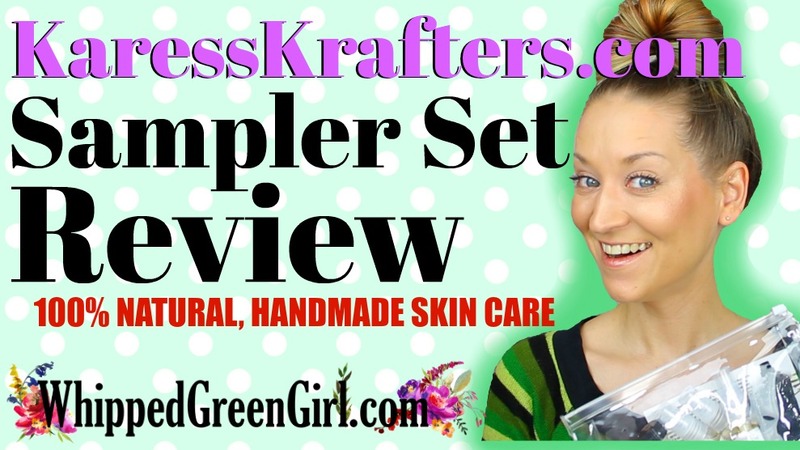 Recently, I reached-out to the lovely Karess Krafters about their “SAMPLER SET“! I’m “all about” the whole: TRY BEFORE YOU BUY! BREAKDOWN OF TRAVEL-SIZE ITEMS IN SET! Coconut Rose Milk Bath Salts: (contained in glass, 1oz. jar- same for all other lotions too): Consider this, the everything bath salts! Some botanical flowers, essential oils, salts, butters – everything to make your skin happy while soaking! Plus, it smells like coconuts! Love the moisturizing effect. I’d order this again for sure. Citrus Lemongrass Body Lotion: Truly, a beautiful, creamy, light lotion. I’ll be keeping this gem in my purse! Calendula Salve: TOP FAV! Use it on the eczema on my thumb – keeping it at bay! It’s a perfect SALVE texture, plus calendula should be in EVERY lotion! Making a balm out of it, very smart! Rose Water and Aloe Face Toner: Refreshing, loved by all skin. This product does have apple cider vinegar in it too (which does miracles on skin), that cider smell is coming through too! Tranquil Body Oil: Great as a quick slip, moisturizer outta the shower! Clary sage + Ylang Ylang for scent, makes smell pretty but also clean! Sweet almond, Camellia, Avocado Oil & more more… Everyone needs a good body oil. Activated Charcoal Soap: Meant to cleanse pores, has a perfect exfoliating texture, without being to rough on cheeks. QUOTE: It is a gentle, yet effective bar that works extremely well to clean and exfoliate sensitive and problematic skin conditions, such as acne. Lavender Deodorant: Goes on smooth, apply softly – or product will “smoosh”! For the love, the lavender smell is strong and prominent too! You need a good punch like this. There’s some zinc oxide in there. Meaning this deo-stick looks a bit white, but when applied… Kind of like a zinc-based SPF goes on skin: starts-off really white, but then melts clear… This does the same. It’s a simple deo, great for lounging around. Evidence = the little honest tidbits on the jars. If you have 1 ounce of natural skincare knowledge, you won’t be bothered by any of them like myself… Example, these lotions are temperature sensitive, or you may find a bit of herb matter in your salve. Seriously, to me – that just a little love, left behind to me! Favorites out of this SAMPLER SET, that I want full-sizes now, include: GOLDEN BODY BUTTER + CALENDULA SALVE so far! I love how Karess Krafters formulate in a way, that make their products great for everyone’s skin! Finally, 100% satisfaction is guaranteed on all purchases! Yes, every company should proudly stand behind their blends! Happy to see Karess Krafters deliver on all levels – from customers service, accessibility, to caliber of ingredients! Lovely skin mixes, that work, that are simple, and that the whole family can use! SUPPORT LOCAL, FAIR TRADE SKINCARE LIKE KARESS KRAFTERS! Follow KaressKrafters.com on Instagram + Twitter!